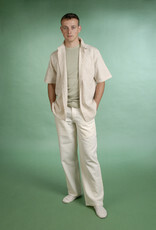 Men short sleeves shirt with a pocket. Home / Men short sleeves shirt with a pocket. Shirts are made with 100% organic tissues and certified free of toxic substances. No dyes, since cotton growing with the true natural colors of the earth. They can be washed in a conventional manner but we recommend using organic detergents and not exceed 30 åÁ C.